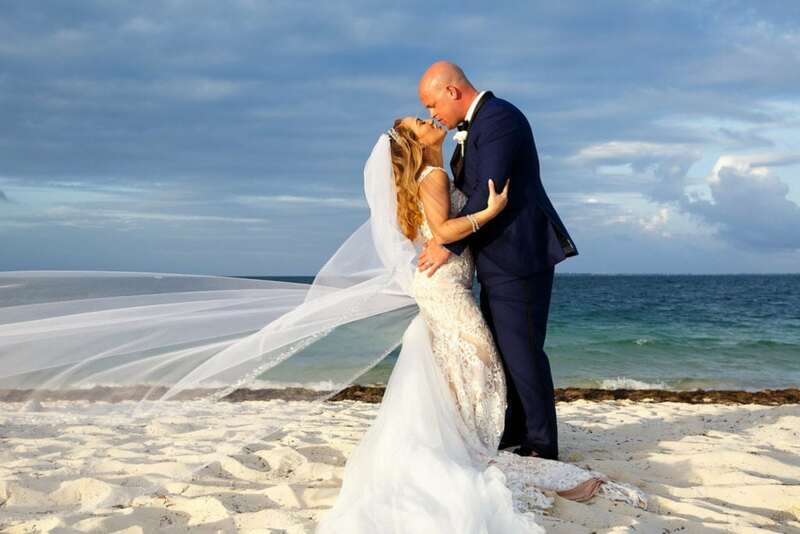 Ashley, a gorgeous salsa dancer from Cali married her true love, a bar owner from NYC in a chic Finest Playa Mujeres Beach Wedding in Cancun, Mexico. These two were simply enjoying life and following their dreams when they met at Matt’s sports bar in New York. After a proposal in Cabos and a vacation in Cancun, they decided Mexico was the place to make it official. 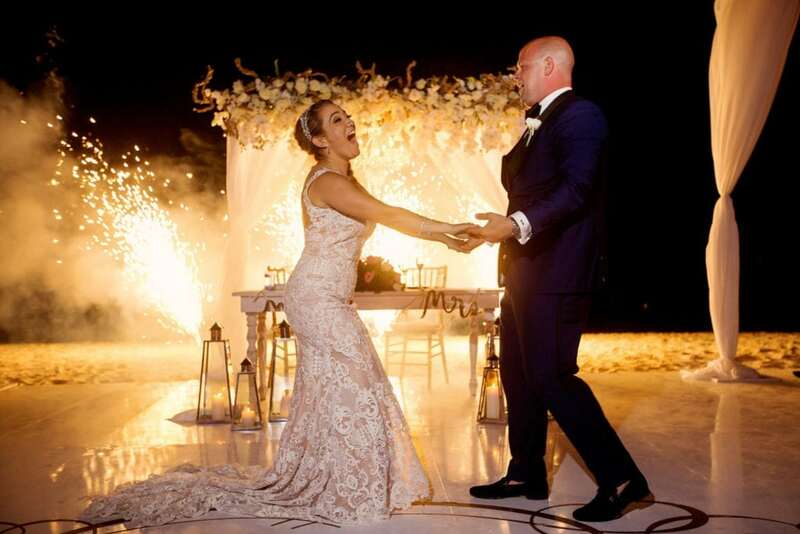 Joined by a fun loving group of friends and family and bringing all the sophistication and glamour from two of the greatest cities in the world, these two humans created a magical beach celebration that will always be remembered. Born and raised in Los Angeles California, Ashley moved to NYC after college to dance Salsa professionally and travel the world. She found a part-time job at Bloomingdales to help pay for her costumes and shoes, then developed a career with them. Matthew was born and raised in The Big Apple. He loves the beach and to be around his family. As a child, he quickly developed a passion for sports and sneakers. As a teen, he followed his passion for sports by joining his high school’s basketball team. As a result, he would one day open a Sports Bar along with his friends called “Bench.” Little did he know this is where he would meet the girl that one day would be his future wife. Ashley would pop by the “Bench” with her friends to watch football from time to time. Sooner than later, they’d go on their first date to the San Gennaro Festival where their hearts made an instant click. Since then these two have been inseparable, and share many similar passions like traveling, shoes, and spending time with their New York and California families. Together they have developed many new passions. For one, they have become quite the “foodies” and love trying new restaurants particularly pizza and Mexican food. They can’t wait to see what other passions they will develop together in the near future as husband and wife! They decided to do a destination wedding because of their love of travel. “Living in NYC is always a hustle and bustle and our escape is always on a beach. 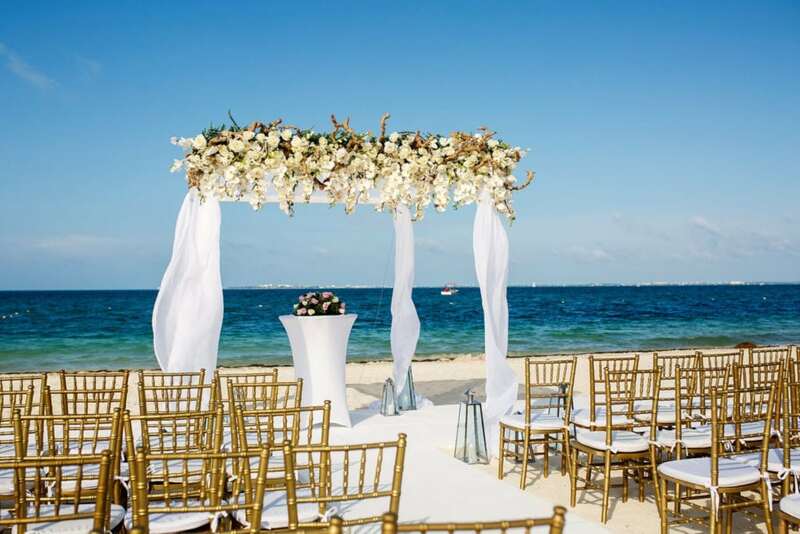 We also chose a destination wedding because he proposed to me in Cabo so we decided to get married in Mexico,” Ashley said. Ashley’s most memorable moment from their wedding day was of her parents walking her down the aisle and Matthew telling her how beautiful she looked when she came closer to him. Because the wedding was held in another country, many of the couple’s family and friends were unable to attend. Luckily, they were able to watch the wedding as it occurred via Facebook Live.